UniClean assumes total responsibility for program administration. All garments and accessories are processed to exact customer specifications, and all administrative and maintenance functions are managed, allowing customers to free themselves of up-front investments and the continuous need to track inventory. UniClean's gamma process programs are for cleanroom businesses that require garments to be virtually free from viable organisms. We achieve this result by exposing the garments to gamma radiation after cleanroom processing to attain desired Sterility Assurance Levels (SAL). This specialty program was established by a Certified Health Physicist and is managed by a Division Quality Manager. The program is maintained in accordance with AAMI recommendations. 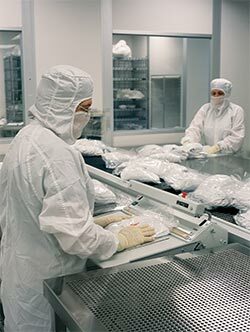 UniClean also offers specialty services for customers who prefer to own their garments, but also wish to receive professional, state-of-the-art cleanroom processing, along with regular pick-ups and deliveries. Regardless of program option, UniClean will inspect every garment, perform repairs, institute spot treatments, and replace any garments according to customer specific requirements.